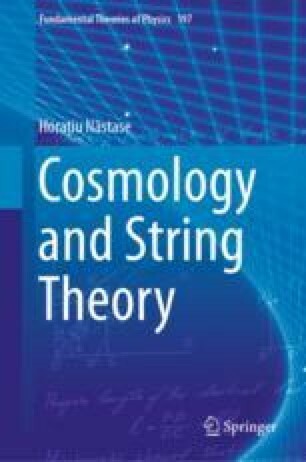 In this chapter, we will describe the AdS/CFT correspondence, which relates a gravity theory, usually in an Anti-de Sitter (AdS) \(d+1\) dimensional background to a field theory with conformal invariance (CFT) in d dimensions, living at a boundary of the space. Therefore the correspondence is an example of a holographic relation, the gravitational physics in the bulk being described holographically (“projected” without losing information) onto the non-gravitational boundary of one dimension less. The AdS/CFT correspondence will be used later on, in part III, for constructing cosmological models. In order to understand that, we will describe the AdS/CFT map for fields and observables.